If someone told me ten years ago, that I’d move from the city, marry a cowboy, live in the middle of nowhere, start a farm, begin raising chickens among other animals (let alone share how to raise chickens), I’d say they were nuts. Even on the day of our wedding, our priest asked me, “how did this city girl from Los Angeles end up with a guy from the sticks”? Good question, Father! God works in mysterious ways. I was a very different person back then. I was very career focused and worked hard to climb the ranks. This amazing and beautiful country life was far from my vision. But this is where we are putting down roots and raising wonderful farm kids. This is the perfect place for us to teach them how to raise chickens and all of the care that is involved. My husband and I began our homestead journey early in our marriage with a rental in the country. There were a few acres where we could grow a garden, add a few animals, and plan out our future goals. For this city girl, I knew nothing about raising chickens. But I knew I wanted a natural lifestyle and I knew I wanted farm fresh eggs. It all started with a trip to our local feed store. It was chick days and I totally fell for it, I was hooked. We purchased 8 baby chicks, right then and there. Before we had a coop or run set up. I definitely don’t recommend doing this! My husband set up a temporary little run and shelter while he began work on building a coop. And then the predators hit. What did I know about predators? Absolutely nothing. But, I was determined to make it work. Let’s start with the basics. 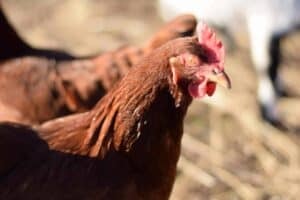 Why get started with chickens? Most people choose to raise chickens for their farm fresh eggs, but there are so many awesome things about chickens. Chickens make great family pets, they are great at teaching children responsibility. 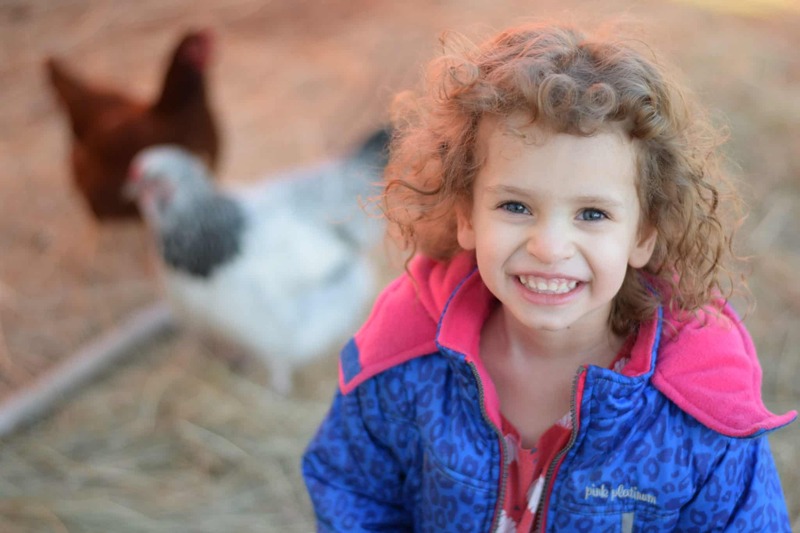 Our toddlers have learned how to feed and water the chickens, how to collect eggs, and my preschooler is learning how to clean the coop properly. Plus they eat bugs. Which is awesome for keeping them out of the home! Chickens require a lot of care, but it isn’t overly complicated. They require a dry home with good ventilation and is safe from predators. Most chickens need about 10 square feet of space to live comfortably. 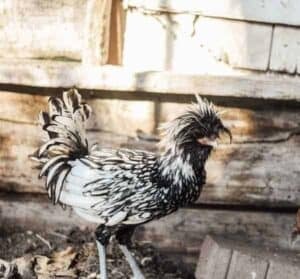 There are a few options for getting started with raising chickens. One is to purchase fertile eggs and hatch them in an incubator, you can purchase baby chicks from a feed store or a hatchery. When raising baby chicks, its important to make sure their temperature is well regulated and they’re staying warm for the first six weeks. 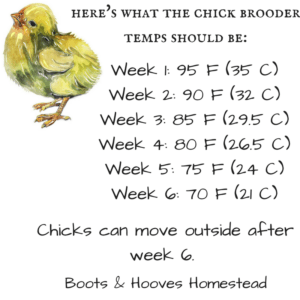 If you don’t have a broody hen or mama chick to keep the babies warm, a brooder will be sufficient. 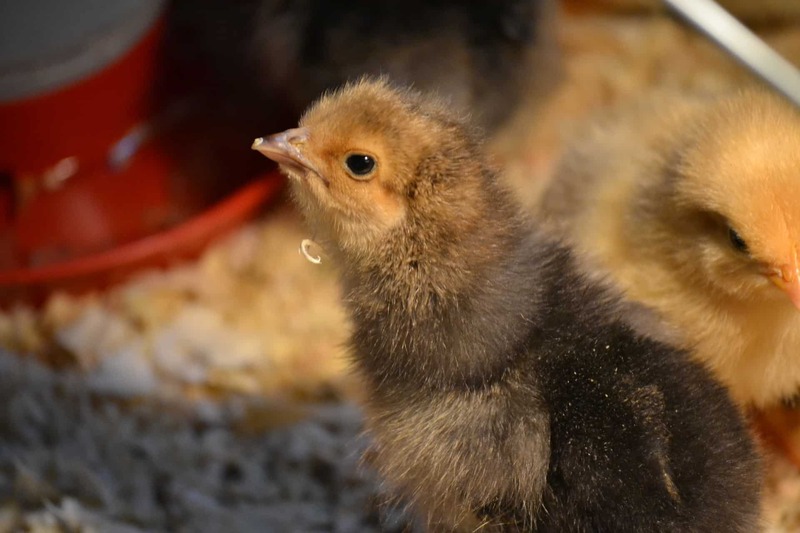 How big the brooder should be will depend on how many chicks you’re starting out with. A big storage tote will work for most or a frugal alternative and something we do often, is to use an old mineral tub. We clean it out throughly first. The next most important thing for the brooder is a heat lamp. Avoid those infrared bulbs that produce red light because they get too hot for the little chicks. From birth to about six weeks, chicks should be fed chick starter feed. We prefer to go with unmedicated. After that point, the chickens should transition to a grower feed. The chickens should remain on this feed until they are 20 weeks old. 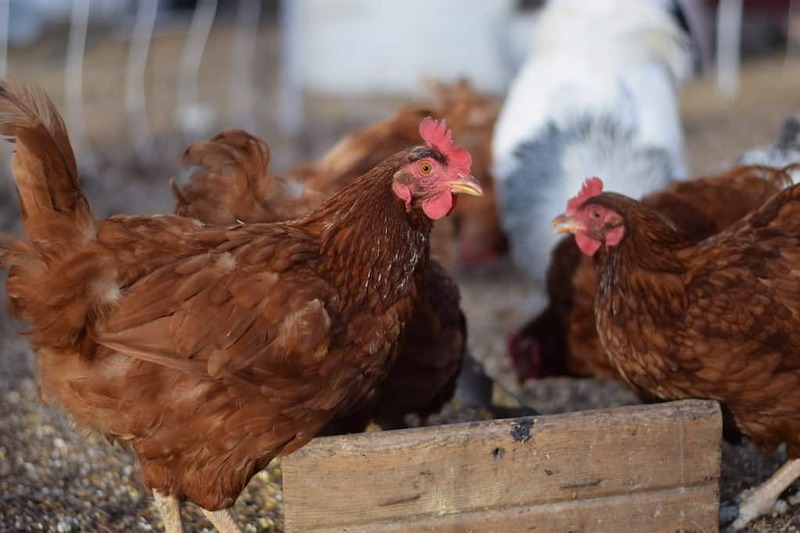 From there, chickens can move to layer feed which has 16% protein. 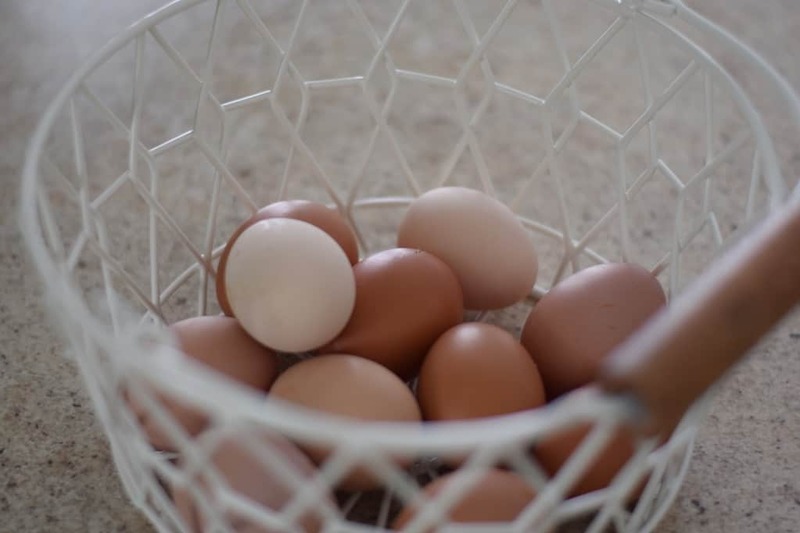 Calcium is essential for hens to develop healthy eggs with strong eggshells, but shouldn’t be given to chickens until they are at least 20 weeks old. We provide a variety of options for our hens, oyster shells and crushed up egg shells both work well for this. 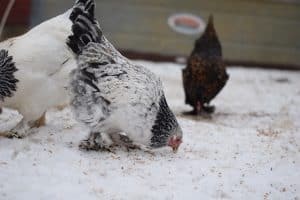 In order for chickens to properly digest their food, they need to be provided grit. 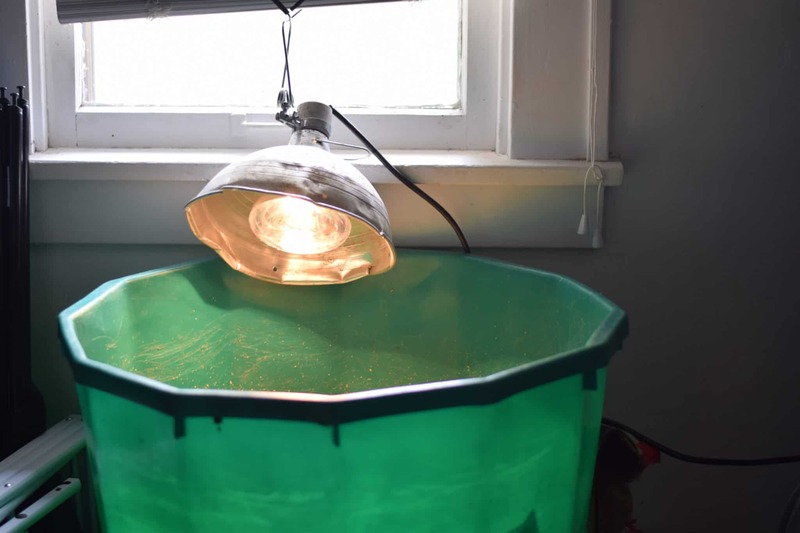 If your chickens don’t have access to dirt and soil, there are these options for young chicks and this for growing chickens and this for layer chickens. In addition to these feed options, providing chickens with fresh water daily is essential. This will vary depending on breed of chicken, but most will lay eggs between 20-24 weeks. Most chickens will lay an egg a day, others will lay between 1-2 a week. 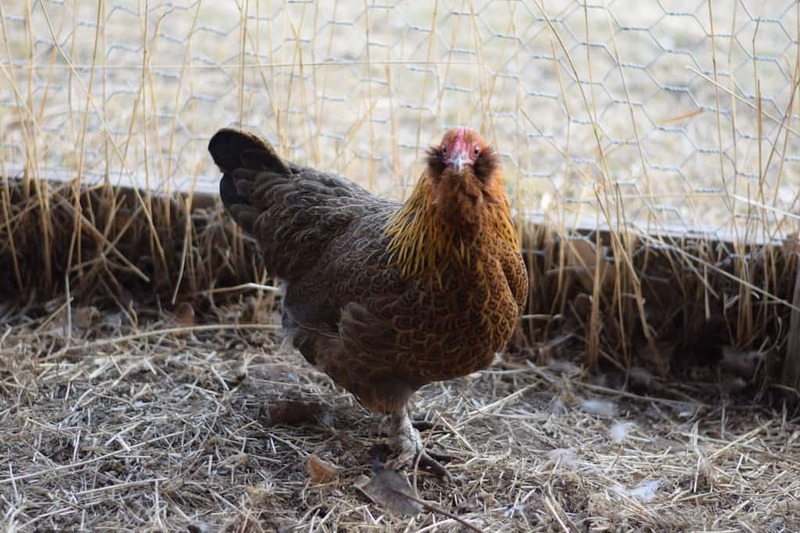 Some factors to consider are the breed of chicken, their age, and the season. Many hens stop laying during the cold winter months. If you want farm fresh eggs, all year round, try adding a few extra chicks to your flock each year. We do this almost every year and by the time the chickens are mature enough for laying, it’s the season where our older gals are slow in production. Daylight is also a factor for winter egg production slowing down. It’s important to allow chickens as much opportunity for natural sun light as possible. More on winter chicken keeping here. One final tip, always check your local zoning laws. 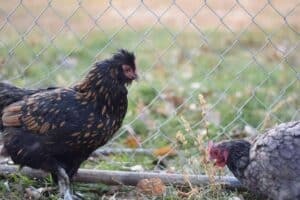 Some places will allow you to keep backyard chickens, but not roosters, even in suburban areas! You may be surprised. Want to know when your chicken will be ready to start paying their rent? Check out 3 signs your hen may be ready to lay.